It's that magical time of year again, temperatures are once again climbing to levels most accurately described as "dangerous" and "oppressive". What a time to be alive. Right about now is when I start furiously Googling stuff like "no-bake desserts" and "coldest shower possible" and "gazpacho, but good." As much as I love all the individual components of gazpacho, I just can't hang with a big bowl of chunky salsa soup, which is the disappointing endpoint of most recipes. Here's the thing: not only is it possible to make silky smooth gazpacho, but the world of chilled summer soups does not start and end with the ubiquitous tomato-based concoction. Most cuisines originating from hot, sticky climates feature at least one chilled soup, and while the specific flavours vary wildly, these dishes usually have three big things in common. First, they tend to be absolutely laden with summer produce and herbs, so they're a great way to use up surplus veggies before they spoil. Second, they tend to be meatless, because big hunks of cold, wet, cooked meat aren't that appetizing. Finally - and most importantly - chilled soups get better the longer they sit. Once you find one you love, park a huge batch of it in your fridge and enjoy a zero-prep, zero-heat meal anytime the mood strikes. No matter what your preferences are, there's a cold soup out there for you. If you love noodles, Korean naengmyeon is right up your alley; garlic fiends will immediately take to Andalusian ajoblanco or Bulgarian tarator. 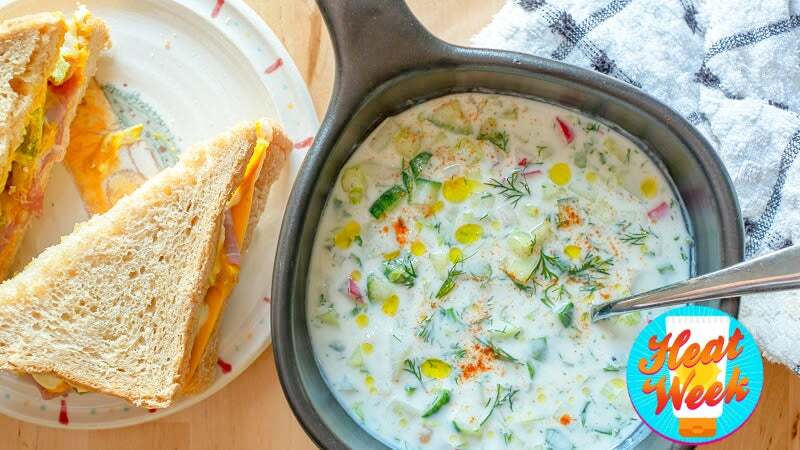 I'm a sucker for high-fat fermented dairy products and fresh dill, so it's probably unsurprising that my favourite summer soups are Russian or Eastern European in origin. Stunningly beautiful, hot magenta holodnik is great for borscht lovers (which I very much am), but its slightly homely cousin okróshka has my heart forever. 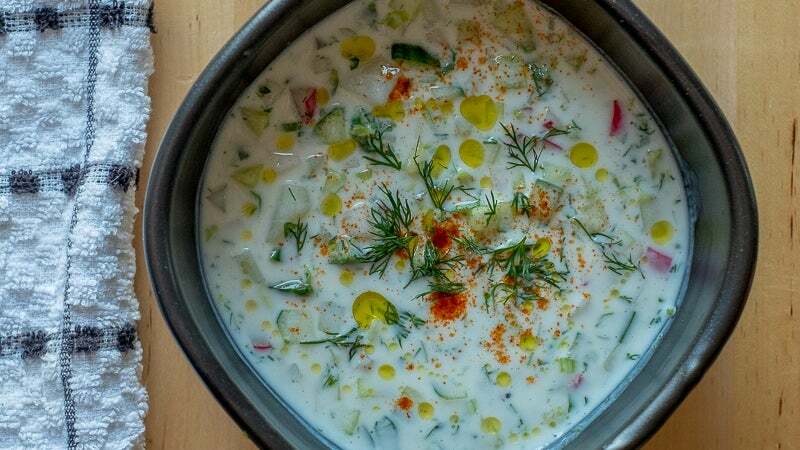 Okróshka is basically just a bunch of small-diced vegetables swimming in salty, herby buttermilk, but that description does it no justice. Like so many of the great dishes, this one is a symphony of contrasting elements: it's simultaneously savoury and refreshing, light and super-filling, herbaceous and tangy and just rich enough to feel like a treat. If you're feeling open-minded - or just plain sick of gazpacho - it's just the ticket for scorchingly hot weather. Potatoes, cucumbers, and radishes are traditional, but you can use any vegetables you like so long as they're properly par-cooked and cooled (or salted and drained). Just don't skip the herbs, which are absolutely crucial; if you don't love celery leaves and dill, use a combination of parsley, chives, cilantro, fresh thyme, mint, basil, or any other fine-textured herb you like. 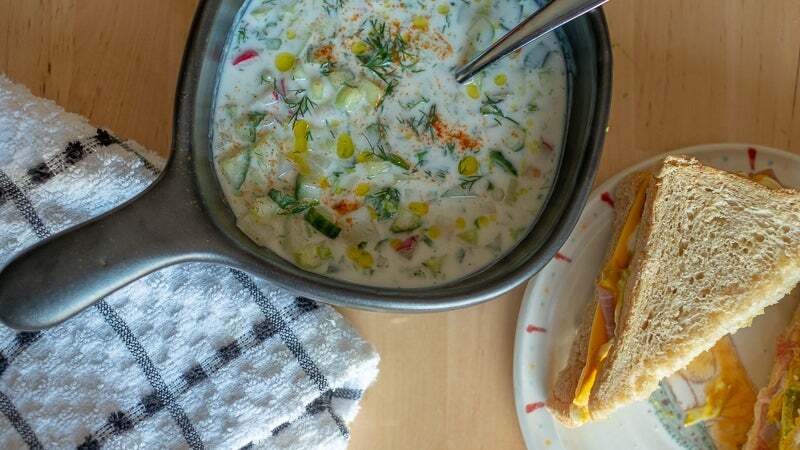 Finally, I think the buttermilk really makes this soup, but if you don't have any, thinned-out plain yogurt (full-fat, please) or sour cream will do in a pinch. This will serve eight people as an appetizer, or four as a main course. First, peel the potato (or potatoes) and cut into ¼-inch dice. Place in a saucepan full of cold, well-salted water and add a tablespoon or two of white vinegar. Bring to a boil over high heat, then reduce heat and simmer for 5-10 minutes, until cooked through but not falling apart. Drain and set aside to cool. While the potatoes cook, peel the cucumber and cut it into ¼-inch dice. Place in a colander set over a large mixing bowl and season with about a teaspoon of table salt; toss to combine. Cover the salted cucumbers with ice cubes and allow to drain for at least an hour. When the cooked potatoes have fully cooled and the cucumbers have drained for an hour, cut the radishes into a ¼-inch dice, chop up the herbs, and slice the scallions. Take the ice cubes off the cucumbers and transfer to a separate container, reserving the drained-off cucumber juice. Pour the buttermilk into the bowl that just had cucumber juice in it, then season to taste with the cucumber juice, lemon juice, salt, and pepper. (You want the base to be pretty quite salty and acidic, so have at it.) 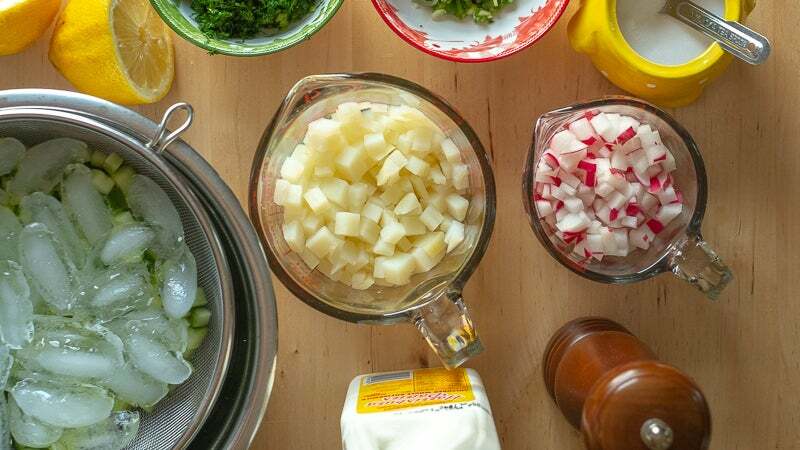 Add the herbs, scallion, potato, cucumber, and radish and stir to combine. This will taste pretty great right off the bat, but it will be even better after an hour in the fridge. Either way, serve garnished with additional chopped herbs and freshly-cracked pepper; if you like them, hard-boiled eggs are a traditional accompaniment. I served mine alongside a deeply contradictory sandwich: homemade bread and mayonnaise, sliced cornichons, jamón serrano, American cheese, and yellow mustard. It was delicious.